Tired of virtual worlds ? 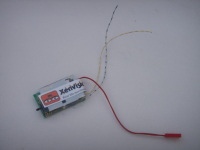 - All in one board with Altitude, Airspeed transducer and emitter. - Almost no cabling: conect the supply, a tubing for Airspeed and fly . - Easy to use, no programming. Have some questions about our products, see our FAQ.